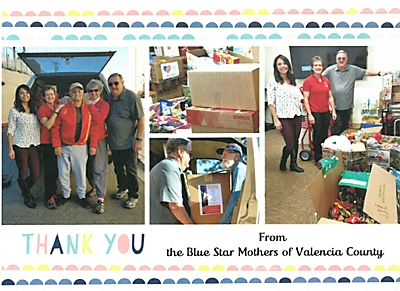 The Blue Star Mothers of Valencia County thank everyone at UNM CCC who donated to Operation Gratitude. "Each package from home is a huge morale booster and our military men and women are grateful to know they are not forgotten while they are away from home. Thank you for helping us support our troops," Ruth, BSMVC.